Usually, when we speak about websites with an old-time feeling, we think about designs with retro, vintage, Art Deco and even a disco atmosphere. The last decade of the twentieth century (aka the 90s) always remains overlooked, though it has already taken a place in our history. It is overfilled with unique and distinctive features such as neon coloring, juicy palettes, grunge vibes, techno flavor, huge graphics, vibrant patterns, radical gradients, unstable layouts, right-aligned pages, Helvetica, Frutiger and much more. It is an important and significant milestone in website design evolution. At that date, the web was imperfect; and creating lightweight and fast websites populated with images or videos, to say nothing about interactivity or motion, were almost beyond possible. However, nowadays we can afford to develop websites with aesthetics taken from the 90s that will be responsive and interactive, and have a flyweight. Today we have gathered ten such examples. Let’s indulge in nostalgia together with these original projects. Cameron’s World is a small personal portfolio that is a clever variation on a cosmic theme. The homepage is overfilled with graphics and animations. Although at first it evokes quite mixed feelings, since the design looks a bit overwhelming and childish, it stands out from the crowd and grabs the attention with its unique appearance. MTV Bump is charged with energy and a powerful music vibe that strikes the eye. The front page gets its original and unique beauty from vibrant and a bit outrageous gradient backgrounds, skeuomorphic-inspired elements, glossy touches, chaotically scattered realistic renderings, animated features and other unusual stuff. A huge custom mouse cursor reinforces the impact. The project is certainly one of a kind. As you may have guessed, this website is dedicated to one of the most popular 8-bit handheld consoles. So that it is not surprising that the author leverages slightly pixelated and imperfect illustrations to convey the atmosphere of that time. The design ideally echoes with the era. Beautiful digital typography has an appropriate high-tech flavor to finish off the theme. Explore the history of the product that is professionally visualized. The title of this project speaks for itself. One of the favorite video games that still is quite popular among geeks has got a fantastic supporting website. The latter offers splendid and top-notch user experience. Not only does it include recognizable scenes from the game, but it also has a music background and some interactive details that unobtrusively make you stay and enjoy the project. Clean interface with intelligible icons used for navigation is a nice twist that goes well with the aesthetics. We the Brave is marked by gorgeous and radiant colors that are bursting with energy. They are associated with the LGBT community. The concept is enriched with visually-appealing details such as intricate 3D buttons, skewed outlined boxes, fancy icons that are placed all over the screen, and an asymmetrical layout. The design serves as an ideal tool for supporting the mission of the project. MKS Graphisme is another website in our collection dedicated to the portable console that was quite popular in the 90s. It is populated with pixel art featuring skillfully reproduced Tetris and Space Invaders. It is a long page that is driven by vertical parallax. There are fancy animations that produce incredible user experience and give motion to the project. The concept perfectly matches the tone of the games and product itself. Movie Mania UK has an original and somewhat strange appearance. Although the website is based on a standard modular system, radical coloring, as well as some visuals and content blocks spin the website creatively thereby giving it zest. The necessary information is quite easy to access, and readability is optimal. Huge boxes that play the role of CTAs instantly catch the eye. The site has a retro vibe with a well-thought-out structure and unusual aesthetics. Merix Studio’s online portfolio owes an excellent and visually appealing look to a fascinating science-fiction adventure “Back to the Future”. Although the movie is originally from the late 80s, the franchise along with video games haunted the minds for almost a decade, so we have included it in our collection. What’s more, it has been the talk of the town quite recently. The website includes some recognizable scenes, twists and tricks that intrigue and invite readers to familiarize themselves with the team, works and services in an enjoyable way. The carefully illustrated environment is spiced up with dynamic and interactive details. 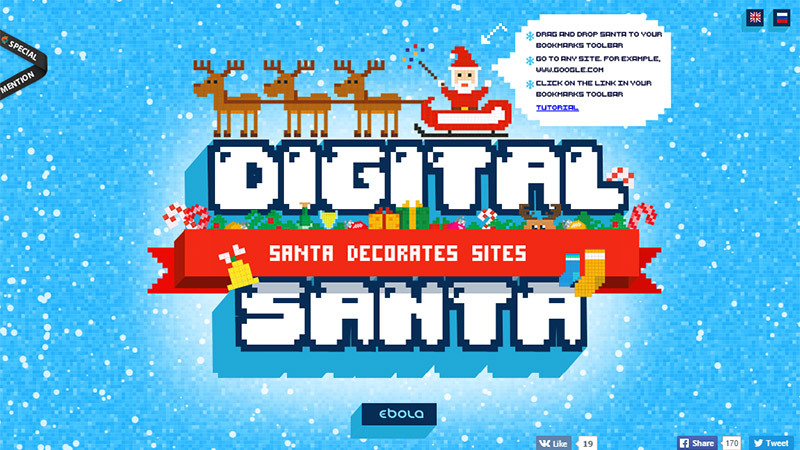 Digital Santa is a seasonal project that is tailored to raise spirits in anticipation of the winter holidays, such as Christmas and New Year. It helps to decorate websites, sprucing up design with a festive mood. Rough 8-bit illustrations, massive techno typography, huge shadows make the website look a bit out-of-date; however, namely this atmosphere sets it apart from the others and forces users to give it a try. BTTF 2015 is another website dedicated to “Back to the Future”. You can watch a video or jump into a carefully crafted adventure. Along with a time machine, you will explore this fully illustrated and informative project. There are main characters and scenes from the movie. The team has shown what has already become a reality (i.e. video conferences through TV) and what is waiting to be brought to life by scientists (i.e. hoverboard). We want to finish our collection with a website, design which was inspired by the 80s. It has a promising and bold title – The 80s Are Awesome. The project is powered by a disco vibe. Starting with tiny UI components such as an old tv screen that serves as a loading bar and ending with the high-tech environment made in a bright coloring, everything is planned down to the last detail. Enjoy the project and refresh your memory. From overwhelming and imperfect 8-bit graphics to vibrant color schemes and marvelous digital fonts, projects inspired by the 90s look original, authentic, splashy and imposing. Thanks to interactive elements, they provide an excellent visual experience. In the midst of flat style, material design, and photo-powered websites they strike the eye and catch the attention.